1796: The sudden fall of a river to a lower level. 1486: Supposedly a name for a group of leopards, spelled as lepe. 1620: Parched peas, as in leap pease. 1698: A leap in the dark, "a hazardous action taken with uncertain consequences"
And that's just a few of the definitions for the noun (another is a basket for fish; I had no idea). The verb form has even more definitions. WNW: One or Two Spaces? Several weeks ago, while waiting to meet with the family after church, Erin and I started talking about our daughters, who are now great friends. Then she mentioned Word Nerd Wednesday and a possible topic. What's the rule for spaces after a period: one or two? With very few exceptions, use ONE space. I know that saying so will make a lot of people annoyed with me. Sorry! I know how hard it is to retrain your thumb to not hit the space bar twice. I learned this the hard way with my first freelance article job. The editor (kindly) asked me to submit my future work with one space so she didn't have to remove the extra spaces for me. I got motivated (hey, money and bylines were on the line!) and quickly trained myself to do one space. To understand today's rule, we need to understand the old one. If you're 35 or older (raising my hand here), you were likely taught to type on an actual typewriter. That typewriter probably used Courier font. Back in the Dark Ages of Courier during typewriter-dom, had we typed with one space after a period, sentences would have run together, making text hard to read. We needed a visual cue for sentence breaks. The solution: Two spaces after a period. Tada! A visual gap between spaces, making the flow of text easy to follow. Enter the computer era, with lots and lots of fonts, almost none of which have equal character sizes. Characters take up all kinds of spaces proportional to the letter or punctuation mark. An M is far wider than an I, for example. With proportional fonts, we no longer needed two spaces; the end of one sentence no longer ran into the beginning of the next, because a space was naturally bigger than a period but smaller than wide letters like W and M.
We got the built-in gap we needed for clarity with one space instead of two. If you stick with two spaces with the modern proportional fonts, the space ends up looking like a massive gap, far bigger than two Courier spaces. Worse, if your writing goes for several lines or paragraphs, you may end up with ugly "rivers" of white space going down the page. Instead of clarifying your words, two spaces makes the whole look amateurish and unprofessional. This is especially true if the document is fully justified, which spreads the text out evenly over the line to create an even look on both margins. With that formatting, if you type two spaces after a period, the justification will spread everything out far, including your double space. You'll end up with giant gaps. I've seen some gaps that look like 4 or 5 spaces. But you should work on doing it right if other eyeballs will be looking at your writing. That includes not just professional or aspiring writers, but anyone applying for college or a job or writing a letter to a business or anything where another person's opinion will matter. It's just like making sure you have no spelling errors. Two spaces doesn't look clean or polished in the 21st century. Most modern fonts simply look better with one space, and two tends to look like a mistake. What if your thumb won't cooperate? Thanks to word processing programs, searching for something specific and replacing it with what you really want is a snap. If you cannot get yourself to type one space, or you find yourself slipping from one space to two spaces and back again, don't stress it. When you're done writing, do a search for two spaces and replace each instance with one space. You'll look professional and save your sanity! I don't remember how I first came across DeNae Handy and her blog, My Read Life Was Backordered. I do remember laughing myself silly reading several posts, coming close to wetting my pants more than once. The first time I met her in real life was about a year and a half ago at the Casual Bloggers Conference, where we were both speaking. She was as fun, funny, and awesome in person as she was on her blog. Turns out, DeNae is a great writer as well as a great person and friend. Several months ago, DeNae asked me if I'd like to be part of an essay collection with a bunch of really cool people. The book would be about our lives—our real, normal, Mormon lives, complete with the chaos of motherhood (or fatherhood), the highs and the lows of faith and family. Nothing saccharine or preachy, just great essays about what it's like being who we are. I immediately said yes, and the final book will be available really soon, to premiere at the Story @ Home conference (where DeNae and I are both teaching again . . . how 'bout that). 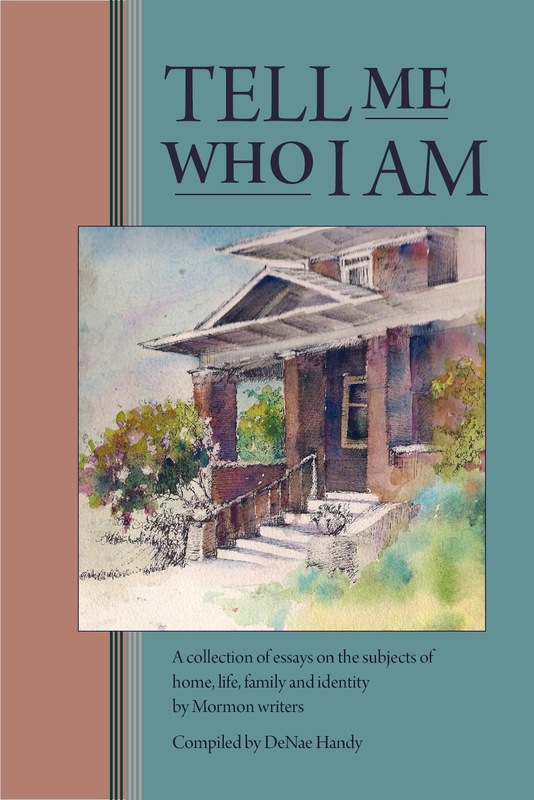 The collection is titled Tell Me Who I Am, and the cover is a gorgeous watercolor by contributor Jana Parkin. Michelle Budge, Gideon Burton, and, of course, DeNae herself. I read it. I laughed. I shed a few tears. It's a great collection with a ton of variety. Just click on the PayPal order button thingy in the sidebar. For more information about ordering, check out DeNae's post about the book HERE. And to read more about what inspired to book, read THIS POST. For today's Word Nerd Wednesday, I'm chiming in a day late with relationship words in other languages. This one's inspired by an article in Big Think by Pamela Haag. I stumbled upon it some time ago that listed top 10 foreign words about relationships that have no English equivalent. Of course, the word nerd in me was all over that. I love how languages have nuance and meaning, and how even a pretty simple translation from one language to another often lacks some of the feel and flavor of the original. Two of my favorite words of all time are Finnish and have no English equivalent: sisu [SEE-soo] and jaksa [YAHK-saw]. Sisu is sometimes translated as "guts," but that's an incredibly lame word for it. Sisu is more of the drive, the fire, the power in someone who endures and comes out the other end. Sort of. You have to know the Finnish to really get it. If you can endure a really hot Finnish sauna then jump in a hole cut into the frozen ice of a lake, you probably have sisu. Jaksa refers to the capability or strength (physical, emotional, whatever) to do something. If someone asks you to go do the laundry, and you say you don't jaksa, they can't argue with you. If you don't jaksa, you just . . . don't. I'll touch on my three favorite words in it, and then you can read the full piece yourself. It's worth it. The first one I'll mention is Cafuné (Brazilian Portuguese). As a writer who has written lots of romantic-ish scenes, this one really come in handy if we had something like it in English: "The act of tenderly running your fingers through someone's hair." I'm totally with the author of the piece on the next one: Why on earth doesn't English have a word to describe "the happiness of meeting again after a long time"? (The words is Retrouvailles (French). And finally, an Arabic word: Ya’aburnee: “You bury me.” In other words, "a declaration of one’s hope that they’ll die before another person, because of how difficult it would be to live without them." As the Haag points out, it's a similar sentiment to "I can't live without you," but far more mature and poetic. I can see an elderly couple saying the Arabic word to one another. The English version, on the other hand, is something a love-struck sixteen year-old would say. Again, here's the link to the original piece. If you know other interesting words without good English equivalents, pass them on! NOTE: THE 2ND PRECISION EDITING GROUP LIVE CRITIQUE WORKSHOP IS 2 WEEKS FROM THIS SATURDAY (ON MARCH 3). YOU WON'T WANT TO MISS OUT. TO REGISTER AND FIND FULL DETAILS, VISIT THE PEG WORKSHOPS BLOG. Next month marks 23 years since a landmark day in my family, a time that forever changed me. My baby nephew received a liver transplant within days of his first birthday. In 1989, infant liver transplants were new. Something like two hospitals in the nation were doing them, and only a few hundred infant liver transplants had even been attempted. Omaha had one of those hospitals. A good number of infants didn't make it. Michael almost didn't. I remember phone calls across the country to plan a funeral. Tears. My brother and his wife practically living at the hospital. Reports that Michael's bed looked like it was covered in plastic spaghetti because of all the tubes. It was one of the first times in my life I dropped to my knees and sobbed with a desperate prayer. He pulled through. Organ donation hit close to home again several years after Michael's transplant, when my cousin's son needed a new heart. He got the heart. It didn't last as long as Michael's liver has, but it did give him a few more years before he passed away shortly before his high school graduation. When my son turned fifteen and got his driver's permit, he almost didn't check the box that would make him an organ donor. It was only then that I realized he didn't know all of his cousin's story. I cleared my throat to ward off emotion then simply said, "Check the box. I'll explain when we get home. You are going to be an organ donor." That same son was only weeks old when I met Sherri. We'd moved into her neighborhood, and I immediately liked her. She coughed a lot, but I was assured she wasn't contagious with anything (which put me at ease when my newborn son was near). Later, my husband and I taught a Primary class filled with energetic 9-year-olds, including Josh, Sherri's son. I learned that Sherri was born with Cystic Fibrosis, a disease I'd never heard of. She taught me about it. I learned how CF sufferers eventually die because their lungs get clogged and damaged with mucus. It's the mucus that made her cough. I found out that when she was born, the life expectancy of babies with CF had been about age 14. She wasn't supposed to have lived as long as she already had, let alone give birth and be around to see her son turn 9. She's fought the odds, worked on keeping herself (and her lungs) as healthy as possible. That means regular hospitalizations, home treatments, medications, and so much more. Sherri and I were good friends. We went to League of Utah Writers meetings together. We joined the same critique group. She moved. She kept fighting. Josh is now in his twenties. He's a returned missionary and a college graduate. His mother wasn't supposed to live long enough to see any of that. She did. In short: Sherri needs new lungs. It's an extraordinarily difficult (and expensive!) decision. Her family has a site devoted to Sherri's story, where people can donate what they can to help. If you can donate even a few dollars, please do. Visit Lungs for Sherri, to learn more about CF, about Sherri, and to donate what you can. FIRST OFF, some news . . .
Back by popular demand: Precision Editing Group is hosting their next Live Critique Workshop in a month! It'll be held at the American Fork Library on Saturday, March 3rd. Attendees are divided among tables, and they get to work with an instructor (staff are all both published writers and professional editors) assigned to each table. Bring along several pages of a work in progress to be workshopped. It's a great learning experience and a bargain to boot. But space IS limited. For full information and instructions for registering, visit the PEG Workshop blog. b) Fewer know how to use it. This post is my small attempt to help a bit in rectifying the numbers of both camps. First off, let's debunk a common misconception. Myth: Semicolons are totally outdated for fiction and, if used at all in today's writing, should be only in stuffy non-fiction work. Truth: Semicolons are alive and well in all kinds of writing, including fiction. Of course, as with any punctuation mark (or word, or literary technique), semicolons can be overused, but that doesn't mean you should avoid them altogether. 1) They allow an association or connection between thoughts that no other method can achieve. 2) They provide a pause length that's different than any other punctuation mark creates. In other words, sometimes you just need a semicolon to get the feel across. This is where I bring out my orchestra conductor analogy. Imagine punctuation as being the signals from a musical conductor (a writer). Each mark tells you, the reader, how to interpret the sentence: whether to slow down, speed up, add emphasis, trail off. As a writer, if you get rid of the semicolon, and you've thrown away what could be the tool for creating the exact feel your sentence needs. While the best semicolon use is when you're connecting two thoughts, technically (from a grammatical standpoint) you can use one to connect any two complete sentences. Ask yourself: Can the words on each side of the semicolon stand alone as a real sentence? Kelly asked if I'd go ballroom dancing with her; I can't dance. 1) Both sides could stand alone as a sentence. 2) The second half has more meaning because of the first half. It's the second part that messes people up. Because the second half gets emphasis, writers sometimes get it into their heads that any emphasis at the end of a sentence requires a semicolon. Not so. If whatever comes after the semicolon isn't a complete sentence, don't use a semicolon. Let's show that in action. Here's an example of trying to give emphasis to the end of a sentence when the second part cannot stand alone as a sentence. David bought Mary a bouquet of her favorite flowers; miniature peach-colored roses. The flower description (miniature peach-colored roses) is not a sentence. Ergo, you cannot use a semicolon before it. But what if you really want to emphasize the kind of flower (or whatever else) at the end? Easy. Pull out a different punctuation mark from your trusty tool box. Use an em dash. David bought Mary a bouquet of her favorite flowers—miniature peach-colored roses. Here is where I'll add one punctuation difference that really is common between fiction and non-fiction. In the example above, you could use a colon instead of an em dash. Either is correct. Just know that colons are relatively rare in fiction. You'll see them here and there, but the majority of the time, colons are saved for non-fiction, and in fiction, em dashes are used instead. To learn more about em dashes and how to make them properly (because no, they are not hyphens smooshed together, and they aren't en dashes), see the last part of THIS POST I wrote for the Precision Editing Group blog some time ago.